I Love You More Than Carrots: The Three Best Brothers. There isn't much I have to say about these pictures other than that the paper prints of these images are hands down some of the most priceless items in my possession. You see, brotherly introductions didn't go at all like I had planned them out in my head. I envisioned breathtaking video of their first meeting in the hospital room. I dreamt of perfectly captured smiles and first touches. 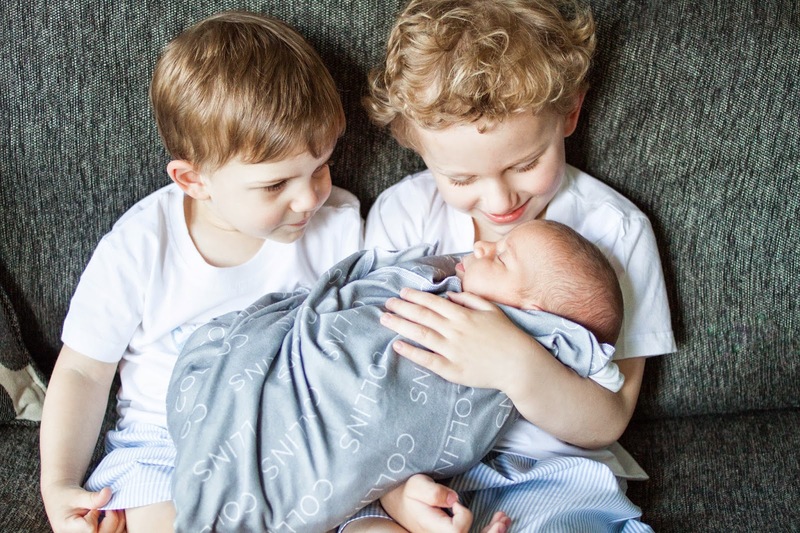 I couldn't wait to have their sweet voices recorded, saying how much they loved their new baby brother and how he was "finally ready to come home," a question that, for weeks, plagued me day in and day out. The Big Brothers couldn't wait for that day. Unfortunately in the days leading up to my admission in the hospital, both boys began battling illness. Maclane, a simple upper respiratory infection that turned him into a walking snot faucet. 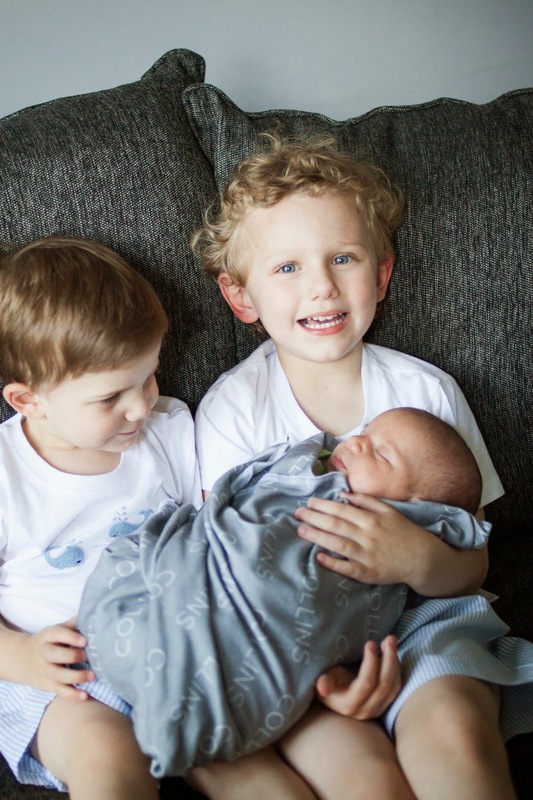 Carter, battled asthma versus allergies versus croup and was treated with steroids and a nebulizer, our pediatrician unsure of what exactly was the cause of his incessant cough, congestion and shortness of breath during activity. While my heart broke for my sick boys, it also ached for the First Meeting that wouldn't happen as I had spent weeks dreaming of. In fact, the boys didn't visit me in the hospital until the morning of my discharge and even then it was under the strictest of rules. "No touching the baby! Kisses on his feet only!" were my first words to them when they arrived to take us home. Maclane never even left the confines of the stroller. It went nothing like I had anticipated. It was almost a week before we let the boys handle Collins. I spent much of the day time quarantined upstairs in our bedroom until we were certain that any and all traces of sickness had vacated. 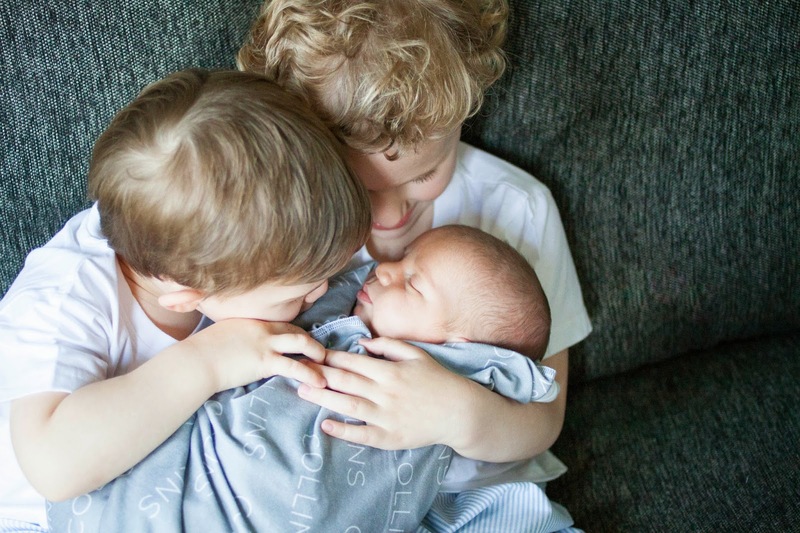 Finally I thought it safe enough to scrub the boys down with hand sanitizer and let them hold their brother. I'm so happy we waited because it was this moment, this series of images, that means more than the world to me. It was absolutely worth the wait and so what if it didn't happen immediately? Because this "first meeting" turned out even better than I had initially anticipated. Beautiful photos! Made me tear up and my ovaries ache. Oy. Too precious for words. These brought tears to my eyes!! I'm so excited for my boys to meet baby number three in a few months!! Those are so precious! I know what you mean. 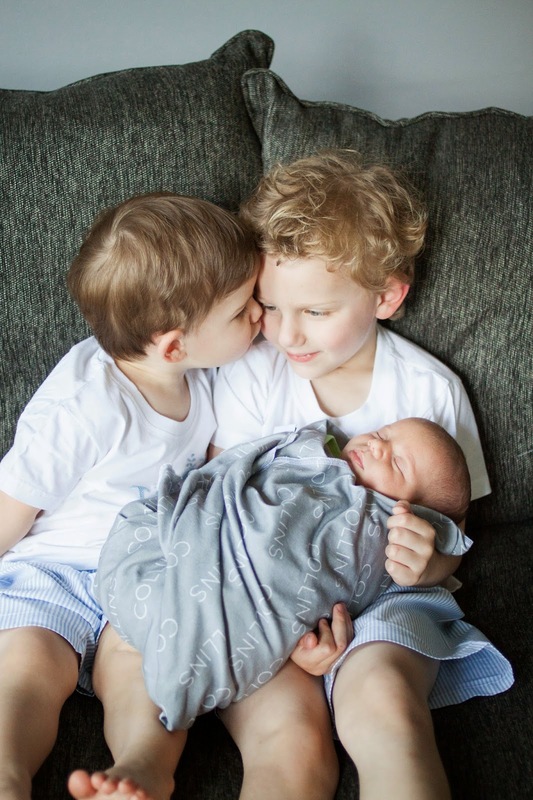 I was so excited to have my son meet his baby sister and imagined him meeting her at the hospital hours after I gave birth. Instead she spent 10 days in the NICU and since flu season didn't end until April 1st (the day after she was discharged) he couldn't come in to meet her. So except for to quick viewings through a window (thanks to our wonderful nurses) he didn't meet her until she came home... and it was such a wonderful moment! I love the one of Maclane kissing Carter. Sweet! These pics are so precious!!! I have twin girls and am currently pregnant with our 3rd and while it scares the crap out of me to have 3 under 3 I cannot wait to see all of my babies together for the first time!! Your boys are just adorable!! I'm in tears, these photos are just so sweet! Perfect pictures! Love Maclane's face in the first one. 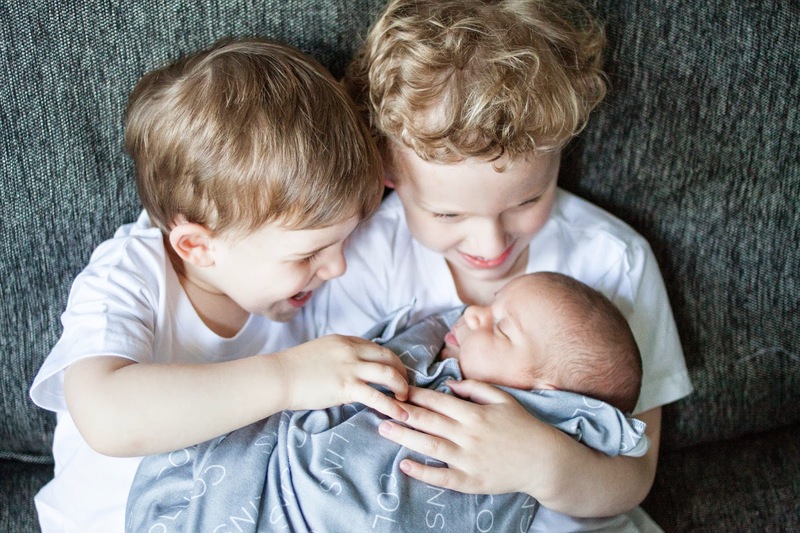 Such proud big brothers! and THIS is why I want to be a mom someday. Happy early Mothers' Day, AP! Precious. What a sweet little family you have! those photos are beyond amazing! Those photos are beautiful. It's amazing how things always work out. I'm so happy you got to capture the moment you were waiting for. Your family is beautiful. This just made my baby maker go boom boom. Gorgeous! GAH! So sweet! Those boys are amazing. Of course... I would expect nothing less than a picture perfect look into your life. Must be hard to appear impeccable all the time. Good thing you can hide it. Oh wait, your little half-assed smile you always have in your "shameless selfies" gives it all away. Stop dying your hair by the way. You are already too pale. Those pictures just melt my mama heart! What a sweet family you have. Those pictures are so sweet! It looks like they adore their little brother!